HIGH QUALITY Oxford Fabric MATERIAL - Using Oxford Fabric cloth to protect your outdoor TV from different weather conditions which could cause damage to your TV such as rain, dew and dust. Also this material is the same one used for professional marine equipment that can ensure your TV safe outdoors. 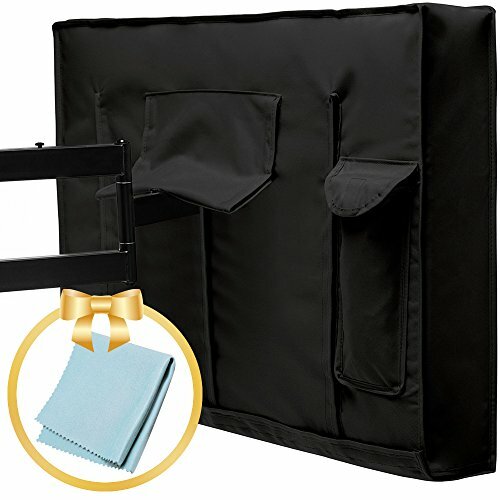 For it offers solid protection with its material, the cover will maximize the lifespan of your outdoor TV. 360 DEGREE PROTECTION - Double Stitched Edges to ensure maximum strength which provides best protection for your TV with durable Velcro straps on the bottom of the cover. Also there is a white big flap in the back of the cover. Therefore the cover is entirely closed. Fully closed cover, including the bottom, means that nothing can come in contact with your TV. ELEGANT-lOOKING DESIGN - This black flat cover is the design of simplicity and looks very stylish. Therefore the cover fits for outdoor locations such as restaurants, hotels, marinas or poolside location, making these areas looks good. Also a waterproof pocket is included in the back, so you can put the remote control in it when the remote is not used. DIFFERENT SIZES AVAILABLE - several different sizes of the cover are provided for your TV. Whatever your TV size is, whatever your TV brand is, you can find the most proper size for your TV which can offer protection in a better way. Besides, the interior fabric of the cover is soft and smooth So don't worry it will scratch your TV screen when you put the cover on TV or remove it from TV. WEATHERPROOF, WATERPROOF - Outdoor TV Covers are made of the high quality Heavy Duty 600D Oxford Fabric which can provide year round protection for your Television from being influenced by such bad situations as rain, mildew, moisture, snow, wind, sunlight, bird droppings. 100% CLOSED, DUST-PROOF - Double stitched edges for maximum strength, provides 360 degree protection for your outdoor television. The Velcro straps at bottom part of the cover, which are more durable than zippers, can provide the maximum coverage against water and dust. FIT FOR SINGLE AND DOUBLE WALL MOUNTS - Because of an extra flap on the rear of the cover, the cover works well for double wall mounts and single wall mounts and also fits flat screen TVs and displays. DIFFERENT SIZES PROVIDED - With the dimensions of 55" W x 35" H x 5" D inches, the cover fits most 55 inches flat screen television of different TV brand. For the interior material is soft, surely your TV screen won't be scratched which is safe as it can be. GUARANTEED TO LAST - With a 3-Year no-questions-asked replacement guarantee, we ensure you a satisfying after-sales service. So if you have any question about the TV cover, feel free to contact us. Part Number: 52" - 55"
If you have any questions about this product by Maskant, contact us by completing and submitting the form below. If you are looking for a specif part number, please include it with your message.